Unlike others Locksmith companies we do not charge a call out fee – You only pay for the work we do. We realise having problems with your locks can be stressful. Thats why we will be you within 30 minutes of receiving your call. What we quote on the phone is what you pay. NO VAT added at the end, or any other nasty surprises! Listed below are some customer testimonials. 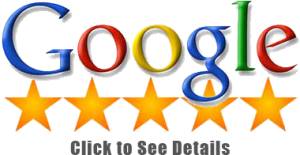 To view more, or to leave a review, please click on the Google sign above. AMAZING! Was straight there when broken into and changed locks in a matter of minutes. Helped us figure out how the door got broken into. I’ve told everyone in my block of flats about you and to get their locks changed! I cannot thank you enough! Just so amazing! Best locksmith in Edinburgh ! Your number is in my speed dial and on our flat community wall! Fantastic service. Someone had put a padlock on my car door handle as a prank – Alcatraz were out within 20 minutes and had the lock off with no damage to the car. Friendly, fast, and reasonable – would recommend. Outstanding service from an absolute professional. Arrived bang on time and sorted the job out without any problems. Thanks! At Alcatraz – Edinburgh Locksmiths, we regard ourselves as a highly moral company. We believe in the work that we do, and in treating customers as we would like to be treated. We always conduct ourselves with honesty and integrity; this is why most our work is through word of mouth and repeat custom. Serving both commercial and domestic clients, we are dedicated to providing people with prompt, friendly customer care. We are highly trained non-destructive locksmiths with years of experience. Our locksmiths have been trained by master locksmiths, who have passed knowledge down from generation to generation. We also take it upon ourselves to continue our professional development, with courses such as the ones offered at the Locksmith Edinburgh Training school. Although we’re located in Edinburgh, we are situated just 2 minutes from the Edinburgh city bypass and the A90. As a result, we can provide a fast and efficient service to Midlothian, East Lothian, West Lothian, Fife, and parts of Central Scotland. That’s why nine times out of ten we will be at your property within 30 minutes of the call. As for inner Edinburgh we can reach the following areas in under 20 minutes: Carrick Knowe, Kings Knowe, Longstone, Sighthill, Clermiston, East Craigs, Drum Brae, Parkgrove, Barnton, Craigleith, Stock Bridge, Comely bank, Murrayfield, Gorgie, Slateford, Morningside, the Meadows, Bruntsfield, Leith walk, Ferry road, Newhaven, Kirkliston, South Queensferry, and all of the Edinburgh city centre. We are proud to provide a speedy, reliable services to our customers at unbeatable prices. Are you locked out and need swift access to your home or business? Do your locks need changed quickly? Do your locks need to be repaired – even in the middle of the night? No matter what the situation is, we are here for you. If you were searching for “Emergency Locksmith Edinburgh” you’ve found exactly the right company. 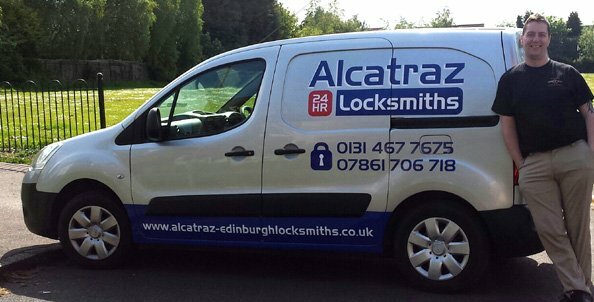 Open seven days a week, the experts at Alcatraz – Edinburgh Locksmiths are more than happy to discuss your needs at any time. No situation is too much for us. We regularly deal with high pressure circumstances. Such as helping parents reach their children inside a locked home, or freeing occupants stuck indoors due to a snapped key in the lock. Accidents can happen anywhere, and at any day. Therefore, unlike some other locksmiths companies, we do not believe you should be penalised for the time an accident occurs. For this reason, our locksmith prices are the same seven days a week. When we work with you, you do not have to worry about receiving a bill for an estimate. We will come out and give you an quote at absolutely no charge – with no pressure to give us the job. We accept credit card or cash payments, saving you a potential trip to the bank by giving you more payment options. The main causes of faulty UPVC door and window locks are wear and tear and lack of proper maintenance. Certain lock components can suffer due to problems relating to poor alignment and lack off lubrication. This can cause broken metal fragments to jam the lock and ultimately lock the householder in or out of their property. Once doors require additional effort to lock correctly, an urgent repair should be a priority. It is much cheaper to merely service your UPVC lock rather than be forced to replace it. This is why it is important to contact a skilled locksmith to maintain your locks and get your door readjusted properly. For more information check out our UPVC door lock repairs Edinburgh page. Many people are content to live with a problem until an essential repair is needed. However, these essential repairs are often more costly and the damage worsens unpredictably. Would you want to leave your home or business unexpectedly vulnerable because you did not want to schedule maintenance? Avoid this headache. Call to set up an appointment with us today. We’re happy to give you advice about your UPVC locks. Plus several other brands and suppliers as well. To enquire about our lock fitting service, or door lock repair service, feel free to call us for a free no-obligation consultation today. Our phone number is 0131 467 7675. You can also use our easy to fill out online contact form, or alternatively, please visit us at our Edinburgh location for more information about how we can help you with your locks.